maurice green – A quirky yet practical look at the inevitable. Fowl play suspected as chickens ruffle feathers in New Zealand cemetery. Two chickens that have begun roosting in the local cemetery have residents in the small South Island town of Tuatapere wondering why the chickens crossed the Clifden Highway. Greeting visitors at the gate of cemetery, the friendly pair then happily wander over graves and around the well-manicured grounds, staying close to their guests. 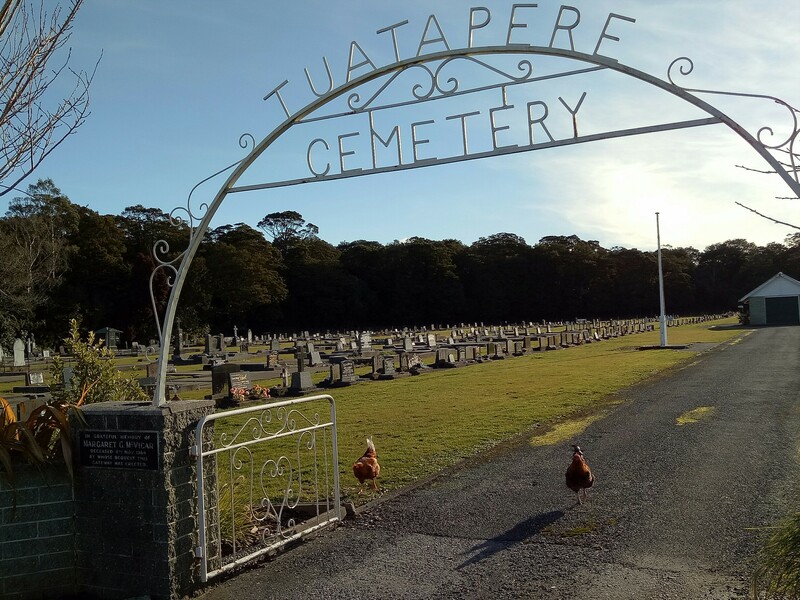 Two chickens arrived at the Tuatapere Cemetery three weeks ago and have been greeting visitors since. Local police officer Senior Constable Damon Templeton said the town’s newest feathered tourist attractions arrived “about three weeks ago”. He said he didn’t know where they came from but it’s not the first time chickens have made themselves at home in the community-run cemetery. Like most others in the region, the Tuatapere Cemetery is several kilometres from the nearby town and sits in a pretty, rural setting. It has a paddock with cows on one side, and native vegetation on the other. Member of the Tuatapere Cemetery Trust, part-time caretaker and “deputy grave-digger”, Maurice Green suspects the same person who released the hens and rooster at the cemetery several years ago may be responsible for the latest feathered residents. “I’ve got an idea who put them there, but I’ll have to see him and ask him quietly,” he chuckled. Mr Green remembers the cemetery’s rooster fondly, despite the handsome bird’s fowl deeds. “He was there for a few years. He was a real character and a cheeky bugger. He said the rooster enjoyed the vegetable tributes that were occasionally left on graves. “The odd grave has veges instead of flower tributes and the rooster loved that,” he laughed. Mr Green is excited to see poultry back among the graves. Tuatapere Cemetery is one of the country’s few cemeteries owned and administered by a community trust. The Trust, comprising of a dedicated team of local volunteers, owns the land and leases some adjoining land to the farmer next door. “So we’ve got room to expand,” explains Mr Green. 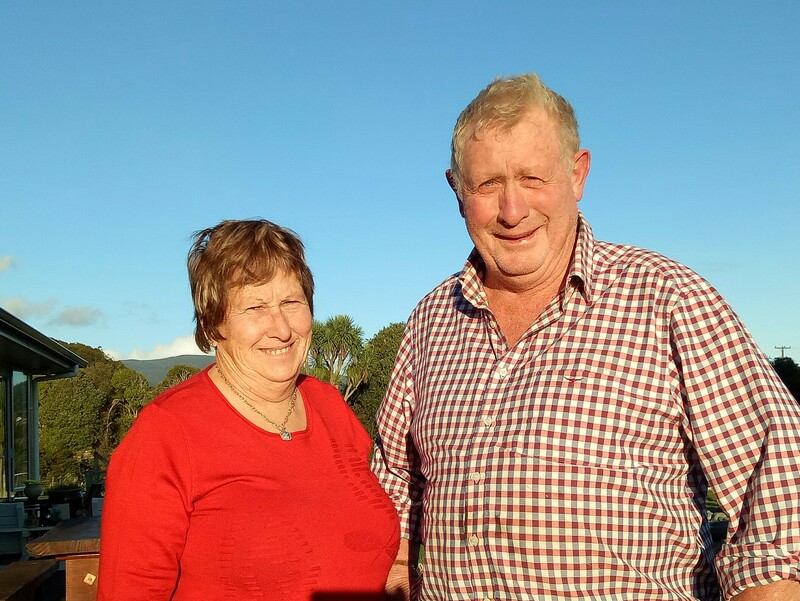 Isabelle and Maurice Green are dedicated volunteers who donate their time to the upkeep of the Tuatapere Cemetery, 80km west of Invercargill. It’s hoped the graveyard’s newest (and only) living residents make Tuatapere Cemetery their final nesting place. “I was so pleased the other day when I saw two more back there. And they’re nice chickens – beautiful colours”. Lisa Herbert regularly wanders through cemeteries. She’s the author of The Bottom Drawer Book: an after death action plan, an amusing and informative workbook for those who want to have a say in their funeral. The second edition is currently available in Australia for $18.95 delivered. Purchase here. It can also be sent to New Zealand for NZ$23.